Public support for legalizing marijuana use is at an all-time high of 54%, though it is virtually unchanged from last year (52%). There is even more agreement that people convicted of possessing small amounts of marijuana should not serve time in jail. About three-quarters of Americans (76%) say that if marijuana use is not legalized, those who are convicted of possessing small amounts of marijuana should not serve jail time. Just 22% favor jail time for those convicted of minor marijuana possession. Views of the legalization of marijuana remain divided along partisan, age and ethnic lines. While support for legalization has increased by 15 points among both parties since 2010, Republicans continue to be far less likely than Democrats to favor legalization (39% vs. 63%). Opposition to legalization also is much higher among those 65 and older than younger people and among Hispanics than non-Hispanic whites or blacks. 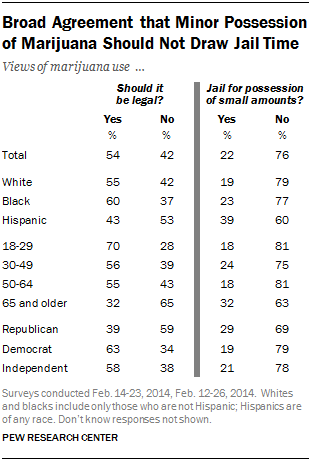 However, majorities across nearly all partisan and demographic groups say possession of small amounts of marijuana should not result in jail time. The partisan differences in these opinions are relatively modest – 79% of Democrats, 78% of independents and 69% of Republicans do not think people convicted of having small amounts of marijuana should serve time in jail. People who have tried marijuana are more likely than those who have not to oppose jail time for minor possession. Still, a majority of those who have never tried marijuana (63%) say people convicted of small amounts of marijuana should not spend time in jail. Among those who have tried marijuana, but not in the past year, 88% oppose jail time for possession of small amounts of marijuana, as do 97% of those who have used it in the past year. When asked which is more harmful to a person’s health, 69% of Americans say alcohol, while just 15% consider marijuana to be more harmful. Similarly, 63% say that if marijuana were as widely available as alcohol, the latter would be more harmful to society; 23% say marijuana would do the most harm. Majorities across most demographic groups say alcohol is more harmful than marijuana to a person’s health and to society. But roughly a third of Hispanics (32%), people 65 and older (31%) and Republicans (36%) say marijuana would be more harmful to society than alcohol, if it were as widely available. Even among those who say the use of marijuana by adults should not be legal, many consider alcohol to be more harmful to a person’s health; 45% say this is the case, compared with 29% who think marijuana is more harmful. But those who say marijuana use should not be legal see it as more harmful to society: 51% marijuana say that if marijuana were as widely available as alcohol, it would be more harmful, while 32% say alcohol would be more harmful. While many support the legalization – or at least the decriminalization – of marijuana use, most (54%) say legalizing marijuana would lead to more underage people trying it. Those ages 65 or older are particularly likely to say the legalization of marijuana would lead to more underage use; 69% in this group say this is the case, compared with about half of those in younger age groups. Majorities of those who say marijuana use should be illegal and those who say it should only be legal for medicinal purposes are also more likely to say the legalization of marijuana would lead to more underage people trying it (80% and 66%, respectively). 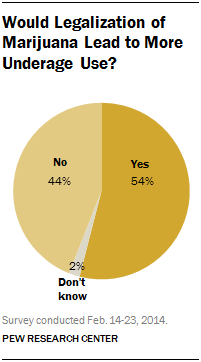 In contrast, just 29% of those who say marijuana should be legal for personal use say the same. The view that legalizing marijuana would lead to more underage people trying it is also more prevalent among Republicans. About two-thirds of Republicans (66%) say this would happen, while about half of Democrats (48%) and independents (51%) agree. Americans overwhelmingly say that if marijuana were legal, it would not bother them if people used marijuana in their own homes; 83% say this, including 60% of those who do not think marijuana use should be legal for personal or medicinal purposes. But 63% would be bothered if people used marijuana in public, including a sizable minority (39%) of those who say marijuana use by adults should be legal for personal use. Older Americans are particularly likely to say that if marijuana were legal, they would be bothered by people using it in public, but majorities across all age groups share this view. About three-quarters (76%) of those 65 or older would be bothered by marijuana use in public, as would 56% of those under 30, 60% of those 30-49 and 64% of 50- to 64-year-olds. When asked if it would bother them if a store or business selling marijuana legally opened up in their neighborhood, about six-in-ten (57%) say they would not be bothered, but majorities of those who say marijuana use should not be legal (76%) and those who say it should only be legal for medicinal use (57%) would be bothered by this. Hispanics are more likely than non-Hispanic whites and blacks to say it would bother them if a store of business selling marijuana opened up in their neighborhood; 51% of Hispanics say they would be bothered and 47% would not. In contrast, about six-in-ten whites (58%) and blacks (62%) would not be bothered by this.